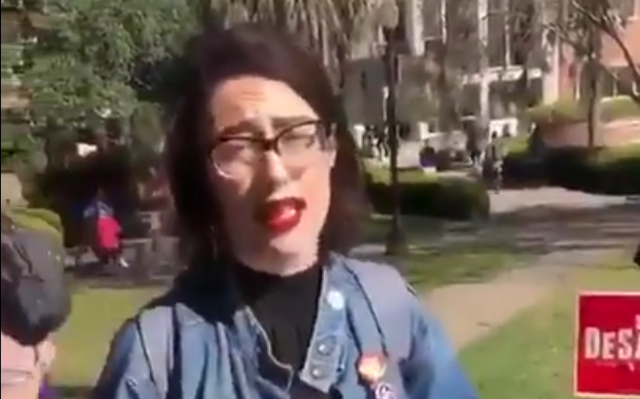 Shelby Shoup, an FSU communist (Hammer and Sickle pin proudly displayed on her jacket) and Andrew Gillum intern, is a shining example why parents should think twice about sending their kids to college. Clearly she was corrupted before she got into college by the left, but there is no doubt her radical uncontrollable behavior was nurtured by her professors. The good news is Shoup has been arrested for hurling milk and hitting College Republicans at FSU. Some may roll their eyes that what she did in the larger scope was harmless, but precedent must be set. If she is permitted to get away with hurling milk, what happens if someone hurls scalding hot water or coffee? And maybe that passer-by getting smacked the next time around could be a blow to their head with a bike lock concealed in a bag of some sort. Leftists are dangerous, even clueless, unhinged, frail looking ones like Shoup. She has no idea what she’s talking about, gets called out for being clueless and as you can see becomes enraged and violent. That’s all these people know 0-10, submit or else. If you want this to end you’re going to have to get to the polls Nov 6th POLITICALLY exterminating democrats from power. Assaults against Trump supporters, conservatives and republicans isn’t going to stop so long as radicals like Maxine Waters, Cory Booker, Nancy Pelosi and co hold office, who encourage this kind of behavior. Get them out of office, change some laws, strengthen others so leftists will think twice before lashing out. Throw them in jail, prosecute them to the fullest extent of the law DO NOT allow DA’s to offer plea deals and if possible sue these SOB’s for every penny they have!